The Mote v New Ash Green - Away & losing the toss, New Ash Green were put in to bat. The opening pair of G Wale & P Webb set up a good partnership of 53 and later Webb & P Sumner matched it for the 4th wicket. Solid performances right down the lineup added significantly to close out the innings with a respectable 176-7. Amongst the contributing batsmen, P Webb lead with 45 and returner D Baker made 21* on his first innings in 3 years. Unfortunately after tea, luck deserted New Ash Green, they were unable to unseat the opposition opener who batted through for 97*, so even with I Mellor's 3-37, The Mote made their target in the 33rd over. New Ash Green - At home the 2nd XI also losing the toss & inserted, enjoyed similar success with the bat. The opening pair of G Freeman & M Ives setting the standard with a partnership of 55, a whole team effort followed resulting in 163-9 on the scoreboard at tea. Freeman (25) & J Clark (21) leading the figures and the duck cup for once completely ignored. 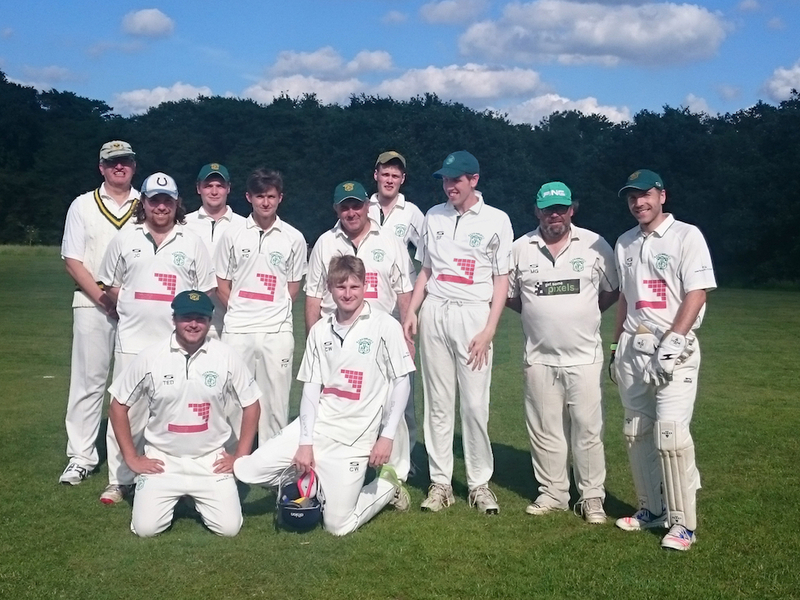 New Ash Green v Old Gravesendians - Trying out a new approach this year to mix T20s in with the regular full Sunday game, New Ash Green once again engaged with their familiar opposition OGs. New Ash Green took to the field and, as usual on a Sunday, spreading the bowling across the team, new recruit A Gleeson shone with 4-14 and, out from behind the wicket, P Webb took 2-16. The opposition racking up a challenging 144-8 in their 20 overs. Foregoing tea for a quicker arrival at the bar after, New Ash Green put in a respectable fightback but were all out for 99. Once again Gleeson (40) proving his value as top scorer for the side. We welcome him to the club and look forward to seeing more from him. † Of course, you are already aware that a hat trick requires all three consecutive wickets to be taken in the same match even if separated by overs from another bowler, or the opposition's innings. However, should MG's next delivery result in a wicket, how successful do you think he will be arguing this point in avoidance of a jug? Kent Regional League Match - 40 Overs. NAG&HCC (9pts) 176-7 (40 overs); The Mote (18pts) 179-6 (32.1 overs); New Ash Green lost by 4 wickets. New Ash green travelled to this fixture still smarting from the previous weekend's defeat but thankfully welcoming back a number of regulars that made the side look much stronger on paper. Coming up against the League's bottom side looked like the ideal opportunity to get the season back on track. Fully adhering to the fact that a toss of a coin is a 50/50 chance, James Nash called wrong to make it won 2, lost 2 from the four completed coin flips so far this season and New Ash Green were unsurprisingly asked to bat first. With the previous week's 97 all out still in the back of the mind, it was a great relief to this week survive the first over unscathed and in fact the opening pair of Gary Wale (17) and Pete Webb (45) took the side over 50 before the first wicket fell, giving the side a much needed confidence boost. However with Wale departing, Matt Scanlan was out the very next ball, shouldering arms to a ball that cut back and given out plumb LBW, and then Dean Freeman, top scorer from last week, was run out by Webb for only 6. New Ash Green had slipped to a precarious 64-3. Fortunately the middle order had been significantly strengthened this week. Stalwarts Paul Sumner (37) and Noel Delaffon (23) made good use of their time at the crease and former 1st XI regular Dave Baker, tempted back to this his first game in 3 years by the Family Fun Day the previous weekend, showed his value contributing 21* to take the team to 176-7, its highest score in a very long time. [Skipper's note to WebEd: If you have the time & the inclination you could have a look to see the last time we scored that many in a league game, I imagine it is a while. With The Mote having made only one significant score all season, New Ash Green were confident they had a bowling attack strong enough to restrict the home side. However, it soon became apparent that the home side had opened with a very able batsman who knew his home ground well. [Later investigation showing that whilst he had been a 2nd XI regular last year, this season he only plays home games, thus switching across XIs and in the III's previous home game he managed 91*.] Despite this Ian Mellor (3-37) and Nash (1-57) went out about dismissing the other batsman, reducing the home side to 44-4 by the 12th over. With their other in-form batsman then coming in at No6, The Mote added 80 for the 5th wicket partnership and continued to wreak havoc with the visitors' bowling figures. The latter was eventually picked off by Joe Elisak (1-38) and in the 32nd over Rob Wills (1-20), in a comparatively tight spell, managed to unseat the No7 on 18. Unfortunately with limited bowling options, and a very batsman friendly track, it had proved impossible to stem the flow of runs, and The Mote reached their target of 177 for the loss of 6 wickets and with almost 8 overs to spare. The opener batting through for 97 not out. Frustration was obviously felt within the team at being unable to capitalise on the excellent work of their first innings, although consolation should be taken that that effort prevented the opposition from enjoying full points from the match. Let there not be too much emphasis put on the fact that New Ash Green are very much looking forward to the home fixture against the same opposition and the opportunity to right some wrongs! Scorecard at Play-Cricket Our playcricket pages also provides team & league statistics. Current League Table See how we are doing so far this season. Second XI ready for their win at home For more club photos check out our gallery & also our instagram.